Today, I went to my parents’ house to help Dad organize another batch of Thalhimers items to donate to the Virginia Historical Society. Immediately, I got caught up in the story all over again. I so easily get lost in the drama of it all. The glamour, the creativity, the tension, the tireless work, the commitment, the loyalty. The sheer breadth and weight of the history Thalhimers spanned. That store endured and witnessed so much. Dad said, “just go through it quickly and see if there’s anything you want to keep for your kids.” But I couldn’t go quickly. I spread things out on the floor and the pool table and gazed at them. I took pictures of pictures. A photo of Grandpa meeting President Gerald Ford. Another of Mary Martin…accompanied by a handwritten letter from her that sounded exactly what you’d think a missive from an actress in the 1950s should sound like. I ran a finger across the etched lettering on a card from Jackie Kennedy. I held a Western Union telegram from President John F. Kennedy asking Grandpa to attend a meeting at the White House. I smelled the musty scent of Amelia Thalhimer’s engagement album from 1877, full of handwritten poems and drawings from her long-forgotten friends. Dad and I turned the pages of Isaac Thalhimer’s prayerbook to find where he had written the birth and death dates of our ancestors in the center pages. Dad said, “can we part with these things?” Yes, we decided. We can part with them if it means we can share the story with others. The only thing I kept was Grandpa’s Thalhimers charge card. I simply can’t part with it. Today, six years after releasing my book, here’s the thing that struck me most: all of a sudden, I had complete clarity about the painstaking work that went into that book…and everything that I DIDN’T include. Perhaps I edited it too tightly and left out too much. I deeply regret not including detailed endnotes to show how much research went behind single sentences. I wish I could go back in time and show more of the seams on the underside of the nice, neat hemlines of my book. A memory came flooding back to me. I was sitting in the hallway of the Richmond Ballet as a girl, putting my hair into a bun for class while watching the professional dancers remove their ballet shoes. And oh, their feet. They were bloodied and bruised. Covered in bandages. These dancers float like chiffon onstage, so effortless and fluid with their sparkling eyes and sculpted bodies and gazelle-like grace. You can’t see any of the blood or the bandages. Because they don’t want us to see that part. They want us to see the beauty of their art…not the pain. I’m a perfectionist, yet I’ve come to understand that perfection only dulls our sharpest blades the more we try to achieve it. In my attempt at perfection, I physically hurt myself in ways I’m still trying to heal…but you can’t see that part when you hold the book in your hands. You see a pretty turquoise cover encapsulating nice, neat stories and lovely images. Writing a book was a painful process, but I hope some beauty came of it. The story still enchants me. And if my family could dedicate their lives to building a store for 150 years, a degenerated disk and some residual anxiety seems like a small price to pay to tell their extraordinary story. Try this recipe, then enjoy a popover while you sit to read Finding Thalhimers. Let me know what you think…of the popover AND the book! Preheat oven to 400 degrees. Using a muffin pan or popover pan, place 1 tsp. oil in each muffin cup. Place in oven until oil sizzles. In electric mixer at medium speed, beat flour, eggs, 1 1/2 cups milk, sugar and baking powder for 15 minutes. Add remaining 1 1/2 cups milk and beat 5 minutes longer. Pour batter into sizzling hot oil in muffin cups, filling each cup halfway. Bake about 20 minutes (check them at 15 minutes) until golden brown and popped. Serve immediately. Makes approximately 24 muffins (depending on size of muffin pans). On the day they begin demolishing The Store, it’s Grandpa’s ninetieth birthday, but he’s far too weak to attend. Assorted members of the Thalhimer family sit on a stage erected in the middle of Broad Street in front of the derelict downtown Thalhimers building. Throngs of children eat cotton candy as they gather around a juggler on a unicycle. Faces in the crowd tilt upwards to see the huge illustration plastered on the aluminum façade depicting the performing arts center to be built in its place. I can sense Dad’s emotions stirring as city government officials and performing arts foundation members pull a velvet sheath to reveal the massive clock that hung above Thalhimers’ entrance at the corner of Sixth and Broad Street. The crowd claps as our family accepts the clock as a gift. The clock looks lonely sitting on the street, its hands still and its pulse no longer ticking. I think of all of the events it has witnessed: the move from Fifth Street with the red rolling cartons, the Toy Parades and giant candlesticks at Christmastime, the Reynolds aluminum panels going up, the Civil Rights boycotts, the crowds gathered for Thalhimers’ closing day. I wonder how we’ll get the clock home; it’s bigger than my car. Dad said he could never go back to the downtown Thalhimers building after it closed because he didn’t want to see it without customers. When I see the clock sitting there on the street corner, I understand what he means. Sometimes it’s best to remember things at the peak of their glory. I return to The Store about a week later to have one last look. No one in the family accepts the offer to join me, and Ryan says he’s too busy to take a break from work. It’s a muggy summer day, and the workman who unlocks the delivery dock door looks puzzled at my request to go inside. “It’s over a hundred and five degrees in there. You sure you wanna go?” he asks. Growing weary from the heavy heat, I slowly climb five flights of stairs to Dad’s office where we used to play with Snow Bear and Val’s typewriter. My mouth feels dry but my shirt sticks to my back, drenched with sweat. On the fifth floor landing, right where the old Thalhimers delivery wagon once stood, a large blue plastic tarp blocks the entrance to the executive offices. “We’re removing asbestos,” the workman says. “It won’t kill you just to walk through, but be quick.” He lifts the plastic and I duck under. Then I see it – the barely recognizable doorway to Dad’s office. A few scattered plastic letters remain on an office sign in the hallway, but they don’t spell anything. I don’t know what I expected, but Dad’s office is just an empty cinder-block room with sagging roof tiles, a box of nothingness unworthy of even a photograph. I turn around and run up two flights of stairs to the roof of The Store, the bewildered workman following close behind. I step over a partially decomposed pigeon, a pile of skeletal remains and sticky feathers, before bursting out the door to the roof for fresh air. The air is heavy and hot, but I gulp it in and look around at Richmond’s skyline. I finally realize that the city will be more beautiful when this building is gone. It no longer has a purpose. My father, Bernard “Barney” Raskind, was an employee of Thalhimers for more than 40 years before his retirement in the mid 1960s. He died in 1969. 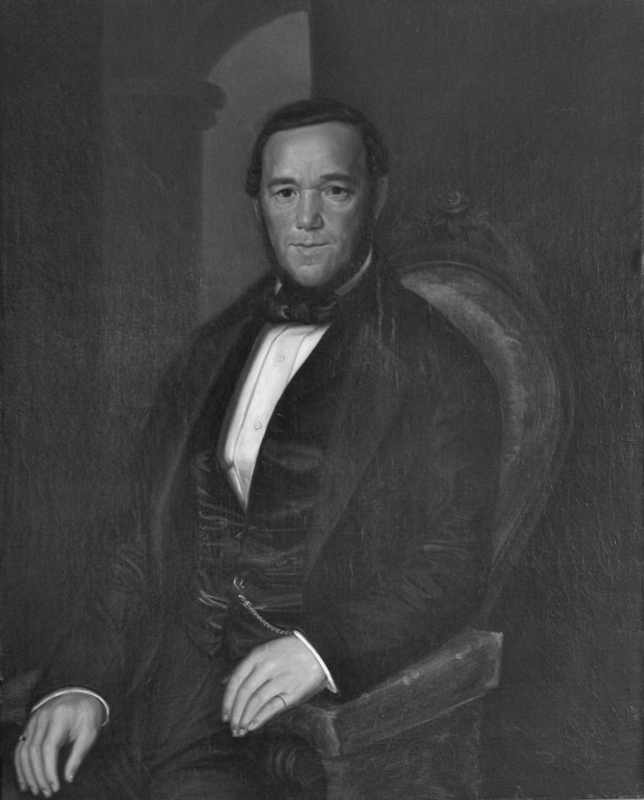 As a shoe buyer for the basement ladies shoes department he often came home from work with stories about the people with whom he was associated. He worked with people like Bert Brent, Howard Klugman, Effie Haight, and Robert Green. These people were also long time Thalhimers employees. Though a serious and conscientious employee, he loved to express his sense of humor at various Thalhimers parties. A line of women’s shoes that was sold in the basement was Enna Jettick. 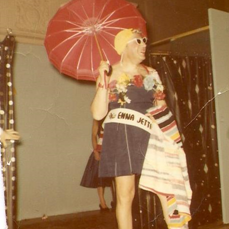 He would don a dress and be known as Miss Enna Jettick. I have attached an old photograph from March 14, 1957, of one of these parties. One of the most interesting stories I can tell you happened just a few years ago only a year or two before Mr. William Thalhimer died. I was sitting in Padow’s Deli when I noticed Mr. Thalhimer sitting a few tables away having lunch. How remarkable that he remembered my father more than 40 years after his death and about 45 years since his retirement from service at Thalhimers. Darth Vader in Ladies’ Shoes! 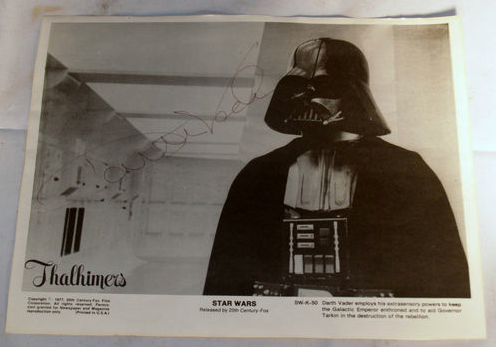 Darth Vader visited the shoe department at Thalhimers on a promotional tour for Star Wars in the late 1970s. My mom took 2-year-old me to the Regency Mall Thalhimers to see Mr. Vader, and I cried. In 1977, Julia Child visited Thalhimers to do a cooking demonstration and sign books. We have a (well-loved and worn) cookbook with her autograph. I’m thrilled to announce that the Thalhimer story has been included in the German Historical Institute’s rich and wonderful Immigrant Entrepreneurship Project, which is available to everyone online. 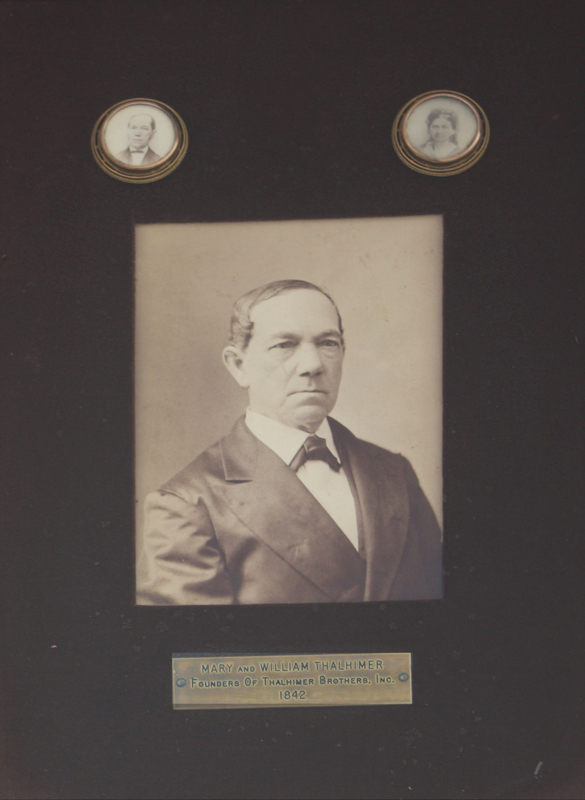 Click here for a masterfully written synopsis of the Thalhimer family story — which started with an enterprising immigrant from Germany named Wolff Thalheimer. It’s great to see his story acknowledged on a national level by such a fine organization as the German Historical Institute in Washington, DC! A new Thalhimers book is born! If you’ve read Finding Thalhimers or attended one of my lectures, then you already know how devoted I am to recording the history of Thalhimers so it isn’t lost forever. So it is with enormous pleasure and pride that I announce the birth of a new Thalhimers book: Thalhimers Department Stores by Emily Golightly Rusk (Arcadia Publishing, 2014). It’s part of Arcadia’s Images of America series, which preserves local and regional histories using archival photographs, so each book is a vivid walk down memory lane. My dear friend Emily Rusk spent years piecing together the history of Thalhimers, and — much like in ballet — her painstaking work pays off in the effortless beauty of this book. Each deliciously vintage image and its caption allows readers to peer through a window into a different part of Thalhimers. Did you know Thalhimers had showers for its shoppers in the downtown Richmond store? Did you know a series of Surrealist window displays at Thalhimers paid homage to Rene Magritte and Salvador Dali in 1948? Did you know Thalhimers had a pet shop in the 1960s? Did you know that there was a tiny train for Thalhimers’ youngest customers on the roof of the downtown store in the early 1950s? If memories of Thalhimers spark any sense of nostalgia for you or your family, then you’ll want to add this book to your collection. Buy a copy from your local bookseller, order one online, or pick one up anywhere Arcadia books are sold (I see them at Barnes & Noble all the time). I couldn’t be prouder to have Thalhimers Department Stores on my bookshelf! Sending enormous gratitude and respect to Emily for birthing this book. Thanks, Emily! All photos reprinted with permission from Thalhimers Department Stores, by Emily Golightly Rusk. Available from the publisher online at http://www.arcadiapublishing.com or by calling 888-313-2665.